ES/Server from NLynx is a low-cost hardware/software gateway for IBM AS/400, System/36�, and Advanced Series/36� users, which allows sharing of a single Twinax connection among seven users on either a Token Ring or Ethernet LAN. Bundled with NLynxs 32-bit Emerald Series Software for Windows and Windows NT�, ES/Server provides powerful, proven 5250 emulation for both Server and Client PCs. With multiple ES/Server adapter cards, you can control multiple AS/400s from a single network mode. Our Multiple System Console Program (MSCP) configuration can help you with this burdensome task. Flexible Twinax connection means increased productivity. The ES/Server solution uses a Twinax connection to the host IBM midrange system through a gateway server PC, which means that it can support the IBM AS/400, System/36 and Advanced Series/36. Since the server provides a single point of contact to the midrange host, there is less configuration and operating overhead, providing better overall host performance. Simple, intuitive installation and configuration. On the PC side, a single protocol can be used for both LAN and host PCs, and since ES/Server is a native Twinax gateway, it does not require the overhead and configuration complexities of an APPC router. ES/Server supports IPX, TCP/IP, and NetBEUI between the Client PC and Gateway, saving the user from having to configure multiple protocol stacks. And the Emerald Series Client software installs quickly and easily, using industry-standard LAN interfaces. Supports most common protocols. 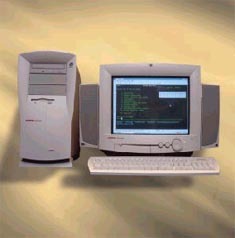 ES/Server supports the most common protocols, provided with Windows 95/98 and Windows NT support in a single solution. Multilanguage support. Localized product for English, French, Italian, German, and Spanish. Hotspots identify host menu items. Host menu items and function keys can be assigned colors. Employ this aesthetic and intuitive approach to locate them quickly and easily, with the simple point-and-click of a mouse button. Keystroke memory and playback (macros). Predefine keystrokes for automated sign-on, repetitive data entry, or unattended operation. Store as many as 2,048 keystrokes in up to 24 keyboard macros. ETU� file transfer support. ETU, an industry standard from NLynx Systems, allows direct file transfer between the PC and System/36, Advanced Series/36, or AS/400. Graphical keyboard mapping allows easy reconfiguration to support existing keyboards. Screen customizations includes color, cursor, field separator character, and font options. Session pooling for access to multiple ES/Server gateways or sessions. Standard edit commands to edit, copy, and paste. Custom toolbar allows users to create their own easy-to-use buttons for frequently used items, including macros. 80- or 132-column monochrome or color display support. Advanced printer support, either direct or network attached. Drop-down menu support using the right mouse button. ETU File Transfer Utility�: File transfer utility that resides on the S/3X or AS/400 and provides menu-driven options for transfer and translation of data between the PC and host. NEW!! USB Twinax: USB attached Twinax Emulation Kit for 64-bit and 32-bit Windows 8, Windows 7, Vista and XP. ES/PCI PCI Emulation Card: For Windows 8, Windows 7, Windows 98/95, Vista. Requires OmniTerm/ES 5250 Emulation Software. ES/Remote: Software and hardware combination that allows users dial-up remote access to an IBM Midrange System. Works in conjunction withNLynxs Axcess/400 Remote Access Unit. Also available for Macintosh and DOS users. ES/Server: Low-cost gateway, connecting via Twinax to an IBM Midrange to share seven emulation sessions (per adapter) over an Ethernet or Token Ring LAN. Selected information on this page Copyright� 1997,1998 by NLynx Systems, Inc., Austin, TX U.S.A.